The Floridan aquifer system is a principal aquifer of the United States and is one of the most productive aquifers in the world. It covers approximately 100,000 square miles of the southeastern United States including all of Florida and parts of Georgia, Alabama, Mississippi, and South Carolina; however, the FAS in Mississippi is not used due to its high salinity and depth. Topography within the study area is relatively flat; altitudes range from sea level along the Atlantic Ocean and Gulf of Mexico coastlines to approximately 500 feet in central Georgia. Water-supply wells were first drilled in the late 1880s and currently the FAS is the primary source of drinking water for almost 10 million people. Water from the FAS is also used for industrial purposes and agricultural irrigation which accounts for nearly 50 percent of all withdrawals from the FAS. 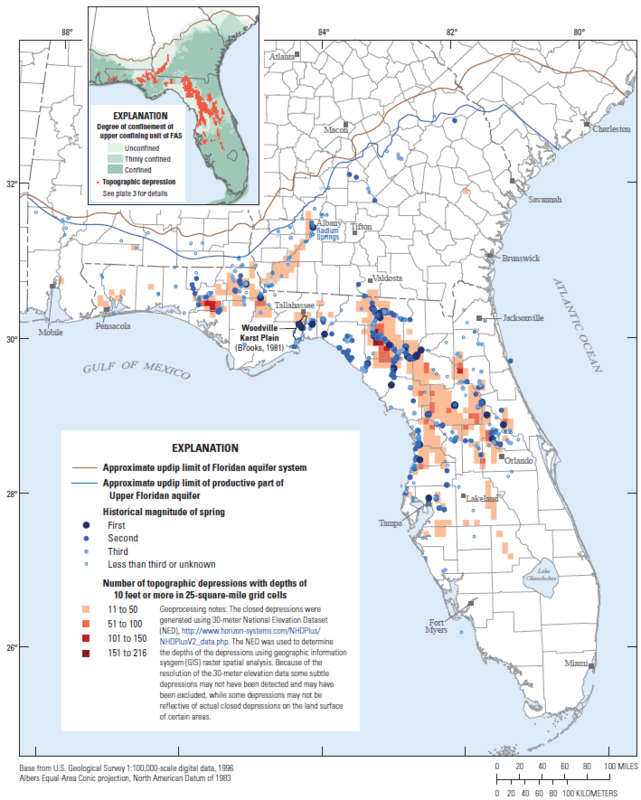 Extent of the Floridan aquifer system. Land use varies widely across the study area and consists of 22 percent wetlands and open water; 45 percent forest or scrub; 23 percent grassland, pasture, and cultivated crops; and 10 percent developed land. In the less populated counties of Georgia, much of the land use is agricultural. Large tracts of agricultural lands also occur in central Florida, and extensive cropland is cultivated in the vicinity of Lake Okeechobee, the largest freshwater lake in Florida (over 700 square miles in surface area). Extensive woody and herbaceous wetlands occur along the coasts in low lying areas and along major rivers and swamps. Some of the larger wetlands include the Everglades in south Florida and the Okefenokee Swamp in Georgia. 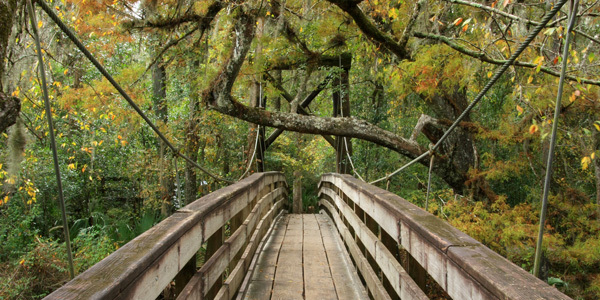 The climate is primarily humid subtropical, with the exception of the southernmost part of Florida that has a tropical climate dominated by wet and dry seasons. Average annual precipitation ranges from 48 to 64 inches; the greatest average rainfall occurs in the panhandle of Florida, coastal Alabama, and southeast Florida. In general, much of the rain occurs during the summer and the winters are relatively drier; however, in some of the northern parts of the study area rainfall is spread more evenly throughout the year. Average-daily minimum temperatures for January range from about 36 to greater than 63 degrees F. Average-daily maximum temperatures for July range from 88 to greater than 90°F. It is common for summer temperatures to reach 90°F throughout most of the area. The FAS consists of a thick sequence of Tertiary carbonate rocks that generally thickens seaward from the northern boundary of the system and is over 3,000 ft thick in south Florida. The top of the FAS is confined by late and middle Miocene series rocks of the upper confining unit (where present) and the bottom is confined by early Paleocene series rocks. 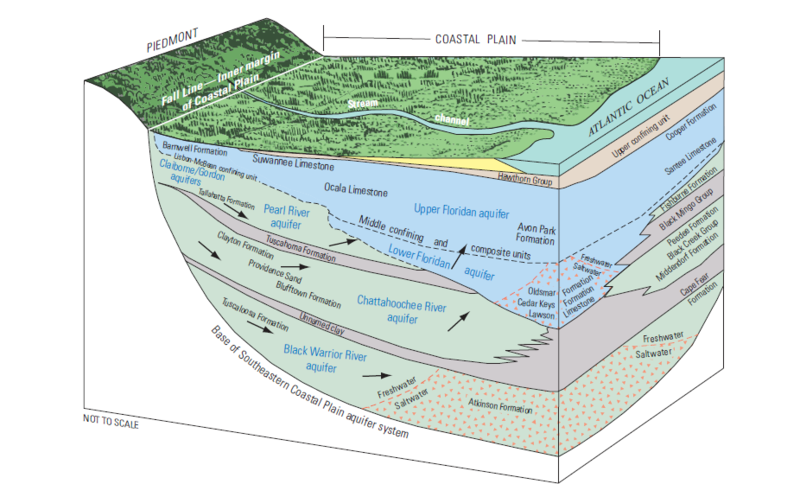 From top to bottom, the major hydrogeologic units of the FAS are the Upper Floridan aquifer (UFA), middle confining and composite units, and Lower Floridan aquifer (LFA). Generalized block diagram, from Williams and Kuniansky (2015). 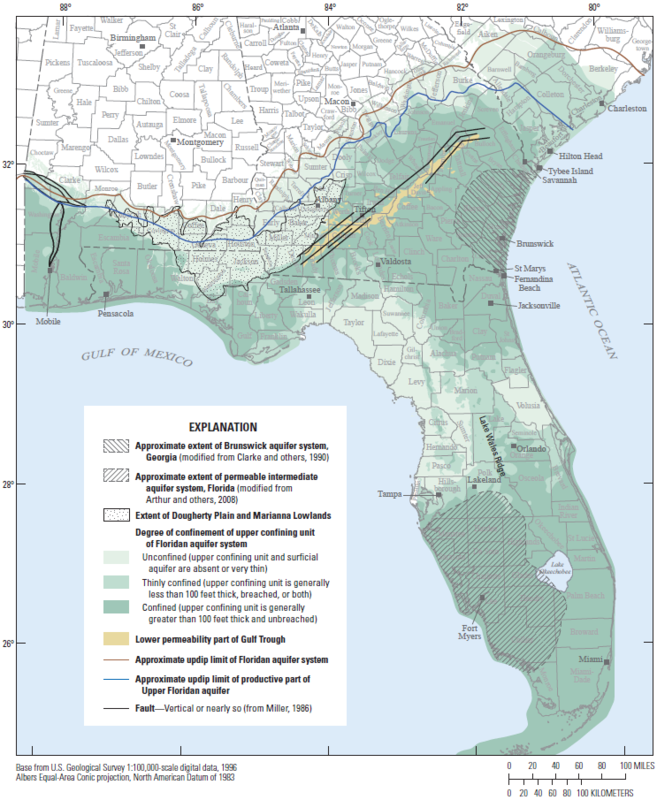 The Floridan aquifer system behaves as one aquifer over much of its extent, though rocks of relatively lower permeability create hydrologic separation between the UFA and LFA sub-regionally. The majority of freshwater is contained in the Upper Floridan aquifer and is used for water supply. In south Florida, the Upper Floridan aquifer is brackish and used for purposes of reverse osmosis source water, blending with shallower fresh Biscayne aquifer groundwater, and aquifer storage and recovery. 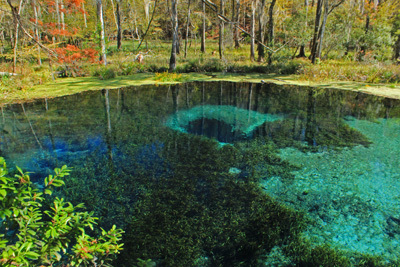 The Lower Floridan aquifer contains fresh to brackish water in northeastern Florida and Georgia, while in south Florida it is saline and used to dispose of effluent from wastewater treatment processes. 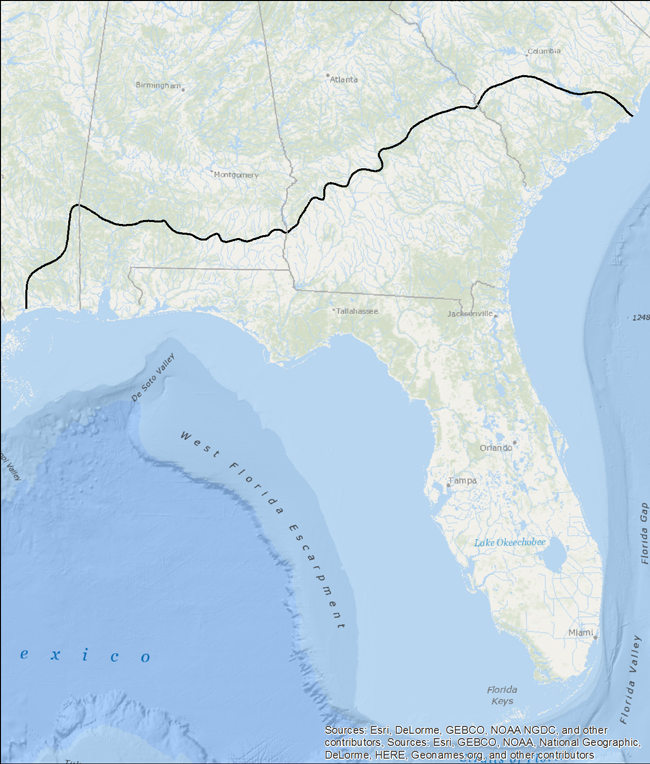 In the northern part of the study area the early Paleocene rocks underlying the FAS comprise part of the Southeastern Coastal Plain aquifer system (SECPAS). Vertical exchange of freshwater between the FAS and SECPAS likely is small, but in updip areas lower units of the FAS are hydraulically connected to clastic-equivalent units composing the upper part of the SECPAS and the degree of water exchange is a matter of debate. These clastic-equivalent units are included in the FAS framework by Williams and Kuniansky (2015) along with an updated extent of the most productive part of the system representing the predominantly carbonate facies (similar to the original extent of Miller (1986). Precipitation is the main source of water to the FAS and in the southeastern United States is approximately 53 inches per year (in/yr), and ranges from 48 to 64 in/yr across the FAS. The majority of recharge to the Floridan aquifer system occurs in the areas where it is unconfined or semiconfined, approximately 10-25 in/yr, whereas in the areas of confinement the recharge is less than 1 in/yr. 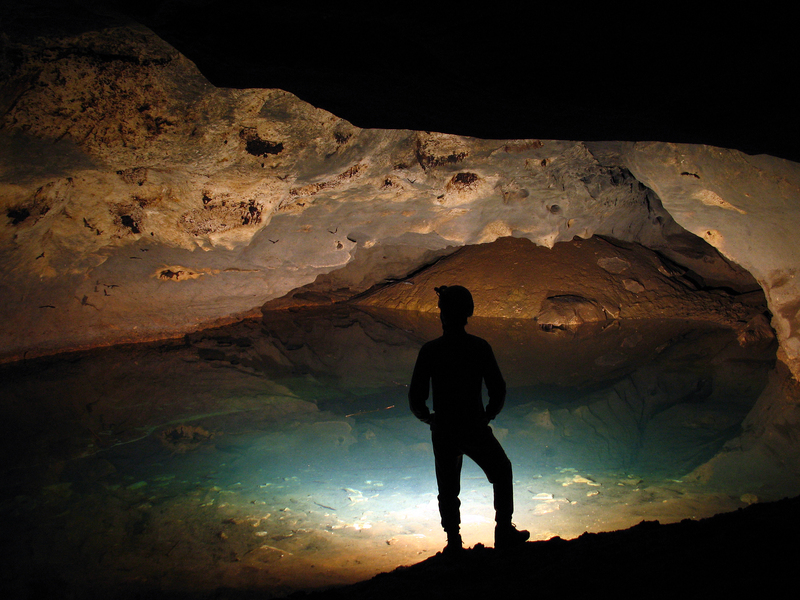 Natural discharge to streams and lakes occurs through springs or to the ocean through submarine groundwater discharge. Florida alone has 33 first-magnitude springs, discharging more than 64.6 million gallons per day per spring (Mgal/d) (see figure 12 of Williams and Kuniansky, 2015). Total withdrawals from the Floridan aquifer, 1950-2010. Withdrawals from the FAS begain in 1887 when the City of Savannah, Georgia, began to supplement surface water withdrawals from the Savannah River with groundwater. At that time artesian heads in the system were 40 ft above land surface and no pumps were needed; by 1898, it was estimated that between 200-300 wells had been finished in South Georgia and by 1943 about 3,500 in the six coastal counties of Georgia. By around 1910-1912, development of the FAS had already occurred in Fernandina and Jacksonville and south along the east coast of Florida as well as from Tampa south to Fort Meyers on the west coast. Over time, the number of wells increased, as did the finished depths, as demand increased. Industrial supply for pulp and paper mills became a large proportion of the water withdrawn starting in the late 1930s. In the 1950s, all municipal, domestic, and industrial supply (except cooling) and about half of agricultural supply in Orlando, Florida, had been converted to groundwater from the FAS. 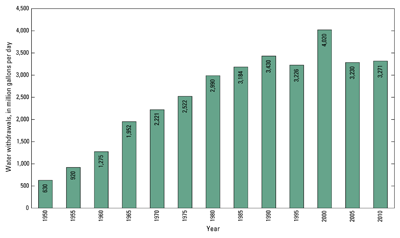 Groundwater withdrawals from the FAS increased steadily from 630 Mgal/d in 1950 to 3,430 Mgal/d in 1990. Permitting and regulations enacted during the 1990s curtailed the year-on-year increases in withdrawal; however, withdrawals in 2000 increased to 4,020 Mgal/d due to extreme drought conditions between 1999 and 2001 that prevailed over much of the Southeastern United States. Much of the increase was due to increased agricultural demand. Further reading on the history of groundwater development of the FAS available in Bush and Johnston (1988) and Marella and Berndt (2005). 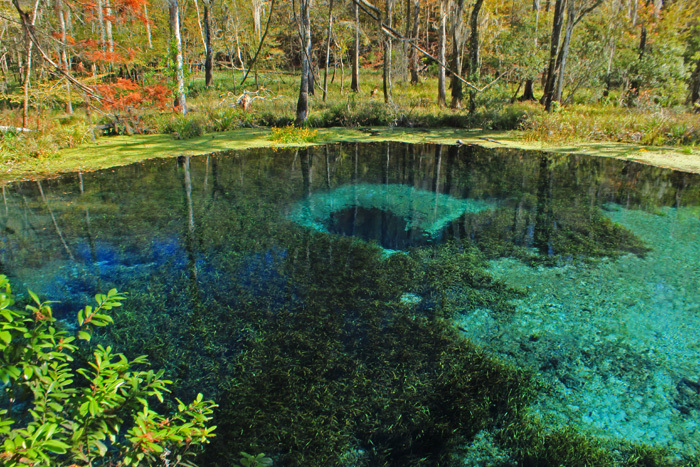 Blue Hole Spring, Suwannee County, Florida: Photo by Alan Cressler, USGS. In Georgia, there is only one magnitude 1 spring, Radium Spring, which no longer flows during drought conditions; there are also six magnitude 2 and five magnitude 3 springs. The largest of the 17 springs in Alabama are three magnitude 3 springs; there are no springs in South Carolina of magnitude 3 or higher. Many springs are known to exist offshore in the Gulf of Mexico and Atlantic Ocean, however the magnitude of discharge from these springs is largely unknown. Crescent Beach spring, located approximately 2.5 miles offshore of Crescent Beach , Florida, was estimated to flow at a rate of up to 1,500 cfs.